Empirical Legal Studies: Large Law Firm Hiring -- Introducing the "Funnel Cloud"
Large Law Firm Hiring -- Introducing the "Funnel Cloud"
Why do law students follow U.S. News ranking? In a story in last week's National Law Journal, Andrew Morriss and I claim that USNWR provides a rough guide to future employment prospects. Yet, drawing upon data on hiring patterns from the NLJ 250 (the 250 largest firms based on number of attorneys) and employment outcomes from the ABA-LSAC Official Guide, Andy and I demonstrate the serious financial perils of overreliance on USNWR. In my opinion, the above chart has at least two takeaways: (1) the funnel cloud formation shows large law firm employment payoffs are non-linear and that the vast majority of schools offer similarly modest, but not insignificant, entree to this sector; (2) based on the volume of green and red at the top of the chart, most large firms prefer to recruit deeper into the class at a Top 20 school (and will pay a price premium of $160,000 per year) rather than shifting their model to lower ranked schoolss. 53% of all new NLJ250 jobs between 2005 and 2007 went to Top 20 biggest feeder schools from 2005. See also Leigh Jones, Hiring More Deeply into Top Schools, Nat'l L. J., Apr. 14, 2007. 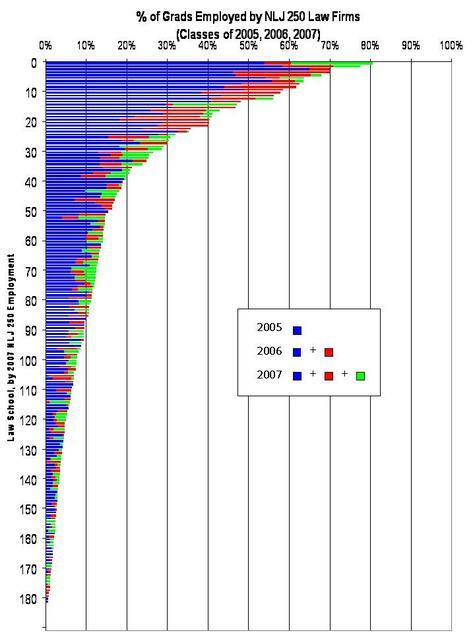 You would think that by 2007, the Top 20 would have been tapped out. Not so. The empirical findings of this 2007 article by Dinovitzer and Garth, which is based on After the JD data, suggest that this elitism has unintended negative consequences in terms of high attrition rates. Employment trends for law school grads: The top 100 out of 194 ABA-approved schools ranked by percentage of 2005 graduates at NLJ 250 firms. These are great Prof. Henderson, and I hope you plan to update these rankings annually. But if I could offer one suggestion. Please try to find some way to fine tune the clerkship numbers. Specifically I'm looking at Seton Hall, whose numbers seem a little, well . . . I'm sure the numbers will make more sense once you separate CoA from easier to attain clerkships. Once you do that, perhaps you can sort not by NLJ250 %, but by NLJ250% + CoA clerkship %. Anyone with a CoA clerkship is virtually assured of an NLJ250 job, if they want it, so you might want to consider combining the two. This change will restore Yale to its deserved top spot. Why is UPenn listed in NY instead of PA? I bet the Alpha Level on this would indicate it is Power Law Distributed or at least displays Power Law Properties. I have found this in my own work with law clerk placements, law professor placements, etc. In terms of a generating function, I would suspect Yule Law or equivalent. Given this is the underlying distribution---US News is certain to mislead as the space between institutions is dramatically non-linear. Anyway, very cool visual. I look forward to seeing more.